'Aril Landmark' ( Henry Danielson, R. 1977). Regeliocyclus. Seedling A-75-1. AR, height 14" (36 cm). Golden bronze with dark brown veins and dots; self styles; mulberry black signal. 'Isolda' X 'Persian Embroidery'. 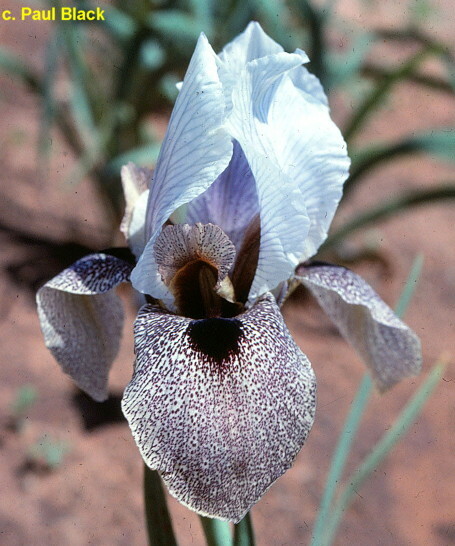 Mount Clare Iris Gardens, 1978. Honorable Mention 1980. From AIS Bulletin #228 Winter 1978 Introducing ARIL LANDMARK-Pure aril (Regeliocyclus), 14", E. Isolda X Persian Embroidery. The flowers have a glittering effect as if sprinkled with gold dust due to the vibrant golden-bronze tints which extend to the stylearms. The stylearms are extremely long, reaching halfway down the falls. Veined dark brown. Large mulberry-black signal. The flower itself resembles solda, the pod parent, but is larger. I have been using it successfully both as a seed and pollen parent. The pollen is extremely fertile on most all arilbreds and will give takes up to 75% on most of the C. G. Whites breeding, some filling the pod with good seed. $35.00. Mount Clare Iris Gardens.